A '20th Century' disease which is 'forgotten' , but not gone, from our midst. NB: For a short, half page summary of polio click here. Whilst there is evidence of isolated occasional cases going back many centuries, paralytic polio has been described as a "20th Century" disease, since the first recorded actual outbreak was not until towards the end of the 19th century (1887 in Sweden). We are also told that polio has essentially disappeared from developed countries. So what caused outbreaks of paralysis to begin so recently from this virus, which was obviously harmless prior to about 100 years ago, and was it the invention of the polio vaccine that made polio almost as suddenly disappear? 1) The polio virus itself. The polio virus is a very small RNA virus, categorized as an enterovirus, meaning that it multiplies primarily in the intestinal tract. The virus itself is very common but in normal circumstances infection with the virus causes no symptoms at all. The body deals with it very easily and quickly. Even the government itself admits in "The Australian Immunisation Handbook" that infection is asymptomatic up to 99.9% of cases, though the true percentage would likely be even closer to 100%. Even when symptoms do occur, they usually only last a few hours (called "abortive poliomyelitis") and include fever, malaise, headache, nausea, vomiting, and slight abdominal discomfort. (See a medical dictionary). In a small proportion of these cases, meningeal irritation and stiffness in the neck or back occurs. In a smaller proportion still, paralysis occurs, but even then rarely lasts longer than a couple of days. So the main thing to understand here is that the polio virus is everywhere, and unless provoked the virus is quite harmless. 2) Cause(s) of (symptomatic) polio. What provokes real illness to result from infection with the polio virus is an assault on the immune system and the deeper and severer the assault, the more likely illness is to occur and the more severe it is likely to be. (1) What provokes paralytic polio is any intramuscular injection, primarily vaccination. It was the late nineteenth century when vaccination was first carried out on a large scale, initially with the smallpox vaccine, and coincidentally(?) the first recorded outbreak of polio was in 1887 in Sweden. The outbreaks of polio that occurred in the 20th century were clearly, from documented medical research, also caused by mass injections, particularly vaccine injections, which in the early part of the century included smallpox and typhoid-paratyphoid, and later included tetanus, diphtheria and whooping cough vaccination. They invented a name for it: “provocation poliomyelitis” or “vaccine-associated poliomyelitis”. A dozen references are included here to show how well documented this is,,,,,,,,,,,,. The polio epidemic last publicised, which peaked around 1950, occurred when diphtheria, whooping cough and tetanus vaccines were first given on a large scale. Paralysis was noted to occur particularly often in the limbs in which these shots had been given. As one would expect, in underdeveloped countries also, paralytic polio was rare before mass vaccination campaigns (for any of the diseases). (2) Susceptibility to polio is increased by anything that weakens or stresses the immune system. - Tonsillectomies were being performed on an enormous scale 50 years ago, including to healthy children (as a preventative so they would not get tonsillitis! ), until the doctors discovered that children who had had their tonsils removed were at an increased risk of contracting polio. This is how the medical establishment discovered that tonsils do actually have a function after all. They are the primary site of the body’s immunological activity against infection. - Antibiotics, also invented just prior to that time, and used even more liberally then than today, also weaken the immune system and interfere with the gut flora - remember that polio is an enterovirus, so a disturbance in the gut flora will increase susceptibility to it. - Exposure to poisons, such as pesticides and the poisons in vaccines, is also obviously harmful to the immune system, and also has direct neurological effects (including paralysis). The site www.geocities.com/harpub provides graphical data that shows the statistical link between recorded polio incidence and the use of pesticides such as DDT. Apart from its liberal use, then banning, in the 1950s, also of interest is the fact that the patent of the first pesticide sprayer (which was used to spray formulations of water, kerosene, soap, and arsenic) was dated 1873. The 1887 polio epidemic also occurred immediately following an unprecedented flurry of pesticide innovations. DDT (chlorophenoethane, dichlorodiphenyl-trichloroethane) was released as an insecticide for general use in 1945, against the advice of investigators who had studied the pharmacology of the compound and found it dangerous for all forms of life. All these pesticides are neurotoxins capable of causing polio-like paralysis regardless or the presence and involvement or otherwise of the polio virus. So the intense use of very harmful pesticides could have been another major reason for the increase in what at least appeared to be paralytic polio. Polio epidemics have come and gone several times since they first began in the late 1800s, indeed had the effect of paralysis been provoked (making the polio visible), epidemics would have been noted going back countless years before that. It is due to forces in Nature over which man has no control, that such a pattern of epidemics occurs. So it may well be simply this that caused the apparent decline in polio in the last publicised epidemic, after it peaked around 1951. Other reasons could also have contributed to it, and it is difficult to know which played the greatest part, but before we look at these factors, it is important to be clear on one thing that simply could NOT have been a reason. That is the polio vaccine. This is indisputable because the decline, both here and in other countries, occurred BEFORE the introduction of the vaccine (1956 in Australia). Further, the same pattern of decline occurred in European countries which did not even extensively use the polio vaccine for many years after its introduction. 1) Intramuscular injections, particularly vaccines. Since parents themselves noted the link of diphtheria and whooping cough vaccines to polio, the compliance rate of these vaccines could have declined. Unfortunately, however, figures on vaccination compliance in this period are not available, so we will probably never be able to check this out. 2) Tonsillectomies. It was during the 1950s that doctors discovered the error of performing tonsillectomies as a standard routine and started to curb that practice14. 3) Antibiotics. We do not know how the pattern of use of antibiotics varied during this period. 4) Nutrition. I doubt there was a significant improvement in nutrition in the short four year period from the peak in around 1951 through to 1955, in which period polio declined by 80-90%. 5) Pesticides. Interestingly, from the early 1950s onward, the use of DDT was shifted out of western countries and into developing nations. When the first, injectable, polio vaccine was tested on 1.8 million American children, within a few days there was a huge epidemic of paralytic polio: in the vaccinated, their parents and other contacts. It was called the Cutter incident and the reason was claimed to be that some of the vaccines (produced by the Cutter Laboratories) contained live poliovirus. So this company was forced to withdraw its vaccines. Polio vaccines produced by all the other manufacturers were also causing paralysis in this and other outbreaks. However all the other manufacturers were part of the enormously powerful Rockefeller Trust. So only the Cutter Labs suffered blame and the polio vaccination campaign was still hailed as a success. 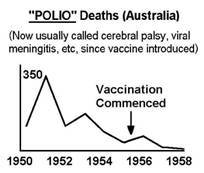 Interestingly, similarly in Australia, the death rate from polio was higher in the first year of the use of the vaccine than it was in the previous year. It is also worth noting that the Salk injected vaccine (IPV) was replaced in 1960 with the Sabin oral vaccine (OPV), obviously because of a problem observed with the Salk vaccine, but of course, as is now acknowledged, the oral vaccine also causes polio, and this is now being given as the reason for going back to the Salk vaccine. (Ironically, the oral vaccine, whilst superior in being oral, contains a much bigger dose of live polio viruses than would be required for a susceptible person to contract polio naturally, as well as the accompanying toxins – so, what is the point??) Jonas Salk and Albert Sabin each said that each other’s vaccine causes polio, and unfortunately, they were both right! The virus in the Salk vaccine is theoretically “inactivated”, and hence it is being claimed that it cannot cause polio, but man’s ability to inactivate viruses has been overestimated – viruses are very resilient and revert easily to their former virulence (or greater). This is proven not only by the above experience of the IPV causing polio, but also with the SV40 monkey virus contaminant of the polio vaccine (The polio vaccine is cultured on monkey kidney tissue). So since the injection process also bypasses important defence processes in the body, the injected vaccine, which will be reintroduced in Australia imminently, would actually be even more dangerous than the oral vaccine. 5) How “polio” was eliminated. With the mass use of the polio vaccines and continuing occurrence of polio in the vaccinated, something significant had to be done to avoid the loss of face with the public. The necessity arose to redefine polio. The classical definition of polio is a disease with residual paralysis which resolves within 2 months (usually within a couple of days). The new definition of polio (in developed countries) became 'a disease with residual paralysis persisting for more than 60 days’. Other criteria were also gradually added. A new disease emerged: viral meningitis. "Since 1958 all States used a case record consisting of a preliminary and a 60-day follow-up form. These changes permitted Centers for Disease Control to analyse only those reported paralytic poliomyelitis cases that can be classified as 'best available paralytic poliomyelitis case count' (BAPPCC). These cases must be clinically and epidemiologically compatible with paralytic poliomyelitis and have a neurological deficit 60 days after onset of initial symptoms, unless death has occurred or the follow-up status is unknown. 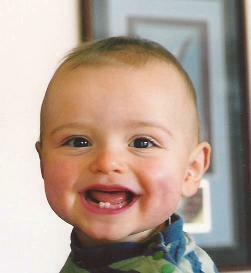 The BAPPCC excludes paralytic poliomyelitis cases with no residual paralysis at 60 days after the onset of symptoms, as well as cases of aseptic meningitis (due to poliovirus or other enteroviruses)"
- EIS Officer, Division of Immunization, Center for Disease Control, Dept of Health and Human Services, USA (personal communication to Dr Isaac Golden dated 26 August 1988). So as this letter from the CDC says, even when the "aseptic meningitis" is paralytic and "due to poliovirus" they STILL will not count it as polio. The CDC MMWR reported in 1984 that in the early '50s there were approximately 50000 cases of "polio" and virtually no "viral meningitis". 10 years later it was the reverse - virtually no "polio" and about 50000 cases of "viral meningitis". The diagnostic guidelines also have now included in them, "No history of immunisation" ("Textbook of Infectious Diseases." - University of Colorado School of Medicine. 1982). It is very important to note that this is the case with all the other diseases for which a vaccine is distributed. The resultant effect on the number of cases reported in the vaccinated is obvious. Apart from viral meningitis, cases that would formally have been called polio are being classified as “cerebral palsy”, “Guillain-Barre syndrome” (the retrospective diagnosis for President Roosevelt's paralysis), and even “muscular dystrophy”. Indeed it appears that usually it gets no name at all - parents have often reported to me that their doctor just told them (correctly) that their child will probably be able to walk again in a few days, and tells them nothing else. Interestingly in recent times countries such as those in Scandinavia have recorded up to 10 times as many cases of polio per year caused by the polio vaccine than in the U.S., despite having populations 50 to 100 times smaller and following a similar vaccination schedule (including the type of polio vaccine used). If the vaccine causes polio at the same rate in Australia, then the equivalent number here is in the order of 500 cases per year, yet we are told that there have been no cases of polio at all here for many years. So children are still contracting polio in our Western countries, provoked by any of the many types of vaccines (and other injections) they receive, but it is now virtually impossible for these cases to meet the criteria to be diagnosed as polio. Sometimes the criteria have been similarly altered on the run in underdeveloped countries in response to campaign disasters. When a vaccination campaign was conducted in the Americas, the result was that the number of cases immediately started to climb. However after about a year there was a divergence between the confirmed cases, which declined from then on, and the number of reported cases, which in contrast continued to climb until the campaign ended. - Apart from a misleadingly strict diagnostic criteria for the disease, another method used to hide the occurrence of polio in the vaccinated is not to count vaccines that have been given so that the sufferer can still be classed as not vaccinated. For example, in an outbreak of polio in Taiwan in 1982, it was stated: “Vaccinations received in the 28 days before onset of illness were not counted because they might have been given after exposure”. In reality, if someone is susceptible to contracting polio from the vaccine, they are most likely to do so after only one dose of the vaccine, and the illness is most likely to appear within 28 days of vaccination. However any medical doctors coming across the article are unlikely to read any more than the article summary, so will miss what the researchers did here, and therefore be successfully misled by the superficial results provided in the summary. The same or similar principle (with the above period chosen after vaccination varying at the convenience of the authors from 14 to 30 days) has been applied in post-mortems of many outbreaks that have occurred in highly vaccinated communities, for example Oman in 1988. - A similar trick that has been used is to falsely imply that polio sufferers are unvaccinated without explicitly saying so. A classic example of this was the “epidemic” of polio in the Netherlands in 1991, in which cases of the disease are referred to as occurring in a religious group that does not vaccinate. To start with, in this “epidemic” there were only five cases of paralytic polio. Only two of these five were in the religious sect, and both were vaccinated, one only the day before he developed paralysis. The virus strain (type 3) isolated in all cases was also indicative of the polio vaccine. In fact the highest incidence occurred in the areas that had the highest vaccination coverage. The World Health Organisation repeatedly extends its projected date for elimination of polio, because the method it continues to use is ineffective. On the contrary, outbreaks of polio continue to occur in the communities around the world after they are hit with a polio vaccination campaign, and the authorities (under the influence of the powerful pharmaceutical industry) refuse to admit the obvious reality, that these campaigns are causing it. A few of a host of examples have been campaigns in India, Egypt, Namibia, Madagascar, Cape Verde, the Philippines, and in the Caribbean. The excuses they make up for what they admit are cases that derive from the vaccine itself, are illogical and transparent. The vaccine poliovirus strains are clearly distinguishable from the wild poliovirus strains – it is routine to check which strain a patient is infected with – and yet even the medical dictionary says “Infection or immunization with one type (of poliovirus) does not protect against the others”, which means there is simply no point vaccinating, as they do, using strains that are different from the wild strains. (This is apart from the fact that vaccination does not work anyway, so would still not work even if the wild strain could be used). "But what about all those children that were in hospital wards in the 1950's in iron lungs?" Iron lungs and calipers were found to be counterproductive for the treatment of polio so the use of them discontinued. It’s as simple as that. Other information on polio is at http://www.whale.to/vaccines/polio4.html, plus Dr Scheibner has written an entire chapter on polio and the polio vaccine (with much more still than what is here) in her book: "Vaccination". "Vaccines are the bargain basement technology of the 20th century." "I didn't know we were importing AIDS." Responding to the question, "so, it was you who introduced the AIDS virus to this country?" He said, YES. of unsuspecting people to wild viruses. Dr. Hilleman acknowledged that the cancer infected polio vaccine had been tested in massive field trials in Russia, then in the U.S. The issues raised in this candid interview raise serious doubts about the propaganda the public has been fed about the safety of vaccines. Vaccines that have been promoted as "safe and effective" miraculous cures have been infecting (possibly) millions of people with cancer, leukemia, and AIDS. The interview was conducted by Dr. Edward Shorter, Professor of the History of Medicine and Professor of Psychiatry, University of Toronto. The authenticity of the tape can be checked with Dr. Shorter who has said that he did it when preparing a PBS series called "The Health Century." Doubleday published a companion volume of the same title in 1987. Dr. Shorter deposited the entire tape of the interview, including portions omitted from the book, along with other interviews in the National Library of Medicine. The person who posted this censored portion of the interview on Youtube is Dr. Leonard Horowitz, a controversial and prolific healthcare expert with multiple academic degrees--including 3 doctorates. McCloskey, B.P, 1954. The relation of prophylactic inoculations to the onset of poliomyelitis. Lancet; 18 April: 659-663. Hill, B.A. and Knowelden, J., 1950. Inoculation and poliomyelitis. A statistical investigation in England and Wales in 1949. Br Med J; 1 July:1-6. MacCallum F.O., 1950. Clinical poliomyelitis in association with peripheral inoculation of prophylactics. Br Med J; 1 July: 6-7. Banks, H.S., and Beale, A.J., 1950. Poliomyelitis and immunisation against whooping-cough and diphtheria. Br Med 5; 29 July: 251-252. Leake, J.P., 1950. Anterior poliomyelitis and pertussis and diphtheria immunization. Br Med 5; 144(3): 259-260. Anderson, G.W., and Skaar, A.E., 1951. Poliomyelitis occurring after antigen injections. Pediatrics; 7 (6): 741-759. Martin, J.K., 1950. Local paralysis in children after injections. Arch Dis Child; 25: 1. Geffen. D.H., 1950. Incidence of paralysis occurring in London children within four weeks after immunisation. Med Offr; 83:137. Wyatt, H.V., 1981. Provocation poliomyelitis: neglected clinical observations from 1914 to 1950. Bull Hist Med; 55: 543-557. Lambert, S.M., 1936. A yaws campaign and an epidemic of poliomyelitis in Western Samoa. J Trop Med Hyg; 389: 4 1-46. Wyatt.H.V., Mahadevan, S.. and Srinivasan, S., 1992. Unnecessary injections and paralytic poliomyelitis in India. Trans Roy Soc Trop Med Hyg; 86: 546-549. Paffenbarger.R.S.,Jr, 1957. The effect of prior tonsillectomy on incidence and clinical type in acute poliomyelitis. Am J Hyg; 66: 131-150. Gerber, P., Hottle, G.A., and Grubbs, R.E., 1961. Inactivation of vacuolating virus (SV40) by formaldehyde. Proc Soc Exp Biol Med; 108: 205 – 209.